It is rare that a book can so perfectly, completely and utterly capture the heart of a hardened bookseller. We are so often disappointed – books won in expensive auctions that are just flat soda, stories of the author being picked up from the slush pile and given that special chance. So many promises and so many galley proofs fall to the wayside. Goddammit, everything is the next Harry Potter, or Time Traveller’s Wife, or Book Thief. But like this book promises, we endure the disappointments for the chance that something will be exhilarating. This is truly the book I wish I had written. This is the book that encompasses the love and joy that books truly bring. That books are how we know and love others, how we stave loneliness and cure our pains. That books make us better people, and are the bridges between the islands we risk becoming. 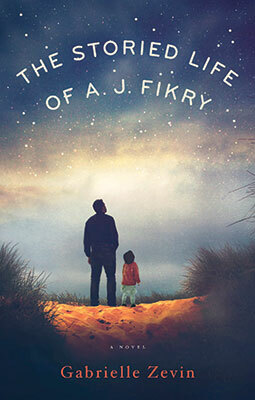 The Collected Works of AJ Fikry by Gabrielle Zevin is the story of a little bookstore, on a little island, and its owner. AJ’s wife has died, he is a deteriorating mess, and it seems that his store won’t survive the winter. On the night his extremely rare copy of Poe’s poetry is stolen, a toddler is left in his store. AJ, freshly widowed and increasingly poor, is smitten by Maya and takes her in. The book follows AJ, Maya and later Amy, and it is the story of books, of love, of children and bad marriages and great friends. It is stories and weird cocktails and publishers, and it moves with a swiftness that brings this book to an immensely successful closure. This is a bookseller’s book. This is for every bookstore owner and manager who has ever sat through a subscription meeting and had to take the awful drek we need to sell so that we can afford to keep literary fiction. It is for every bookseller who ever had to endure that awful insult ‘I could get it cheaper on Amazon’. It is for every bookstore that has had to close its doors, it is for every librarian with a stack of unloved books. It is a book that sings to our literary hearts, and it is one of the most precious books I’ve ever had the pleasure of reading, and I will likely reread it a thousand of times. Please, please read this when it arrives in South Africa this May. I can promise you that it will become precious to you, that Ameila, Maya, AJ and Lambaise will become great friends to you, and you will be richer for it. This is a perfect review. Thank you! Love the sound of it, Zoe! We’ll definitely request it. I enjoyed your review and can only say… Ditto!!! I grilled the clerk in my bookstore like Chief Lambiase… ‘Is this book really a good one?’ She said “You will love it.” I did!